Marrone Anti-Aging Retinol Serum is a pretty good anti-aging retinol serum that helped plump fine lines and smooth out some wrinkles. The texture of this retinol serum is watery and runny when it’s first applied, but it becomes a bit tacky as it starts to dry. The dropper applicator makes it really easy to apply, and a little bit goes a long way… you only need about 2 drops for your entire face and neck. I really don’t like the smell of this product; it has a really strong floral scent that reminds me of an outdated perfume. After using Marrone Anti-Aging Retinol Serum for a short period of time, I didn’t notice much difference to my skin at all. After using this retinol serum for a longer period of time, I started to see a nice difference in the fine lines and wrinkles on my face. I also started to experience a lot of dry skin so I had to start using a more hydrating primer. I was pretty impressed with the way it plumped my fine lines. Overall, Marrone Anti-Aging Retinol Serum was a pretty good retinol serum that I would recommend to anyone looking to plump fine lines and smooth out some wrinkles. The texture and feeling of Marrone Anti-Aging Retinol Serum is really thin and watery, and as it dries down on the skin, it becomes kind of tacky and sticky. Marrone Anti-Aging Retinol Serum is really easy to apply because it has a dropper applicator which I really like. A little of the serum goes a long way and you only need about two drops to cover the entire face and neck. Marrone Anti-Aging Retinol Serum takes about 30-45 seconds to dry, and as it dries, it is kind of sticky. Once it’s dry, it kind of leaves a weird sticky residue on the skin. The residue isn’t awful but it never totally goes away. The smell of Marrone Anti-Aging Retinol Serum is a very strong floral scent that is way too intense. I really don’t like the smell at all. Short term I noticed my skin was looking nice and glowy, but other than that, I didn’t notice any major differences to my skin. Over a longer period of time, Marrone Anti-Aging Retinol Serum started to plump my skin and I actually started to notice a difference in the fine lines and wrinkles on my face. I noticed it mostly in the fine lines around my mouth and forehead, but there were still some stubborn wrinkles that it didn’t do much for. It also dried out my skin pretty bad, and caused me to start needing a more hydrating moisturizer. Marrone Anti-Aging Retinol Serum has some really great ingredients that are supposed to work well for fine lines and wrinkles like jojoba oil, hyaluronic acid, and aloe vera. Jojoba oil is great because it helps restore moisture into the skin which helps maintain elasticity in the face and it can help plump up the fine lines. Hyaluronic acid is great for this skin because it also helps replenish and restore moisture, and helps revitalize the outer layers of the skin getting rid of fine lines and smoothing wrinkles. Aloe vera is great for wrinkles because it is a healing agent that helps heal any damage to the skin like fine lines and wrinkles. These three ingredients should work really well to fight off fine lines and wrinkles and prevent any further wrinkles from developing. 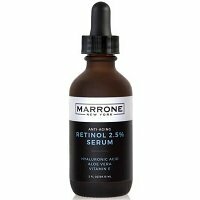 The cost of Marrone Anti-Aging Retinol Serum is $39.99 for 2 oz which comes out to $19.99 per oz. This is kind of a medium to high price for a retinol serum. Marrone Anti-Aging Retinol Serum has a 90 day, 100% money back guarantee, which is great so you can try the product without worry. To buy Marrone Anti-Aging Retinol Serum, click here. Texture/Feel It has a thin and watery texture that becomes a bit sticky. Ingredients Aloe vera helps heal the skin.